Notes: This helps to develop strength in the bottom positions of our Olympic lifts and getting comfortable utilizing the ‘bounce’ at the bottom. Be sure to warmup your knees properly! If you lack mobility, substitute front or back squats focusing on quality body position while seeking to improve depth each round. 1) Back Squat: 1X5@60, 1X5@65, 1X5@70, 1X5@75 – rest exactly 90 seconds (all sets should be fast and without a pause). 2) Front Squat: 1X5@60, 1X5@65, 2X5@70 – rest 2 minutes. Notes: Scale the # of reps and movements as needed! If you feel comfortable inverted but cannot perform full ROM on the HSPUs, feel free to scale the ROM or perform regular push-ups. Sub V-ups for T2B, and sub KBs/DBs for S2OH. “Muscles are torn in the gym, fed in the kitchen and built in the bed”. A lot goes into assuring your body properly recovers after intense workouts in the gym. Sleep, hydration, nutrition, mobility, etc need to be managed for optimal gains especially in the long term. 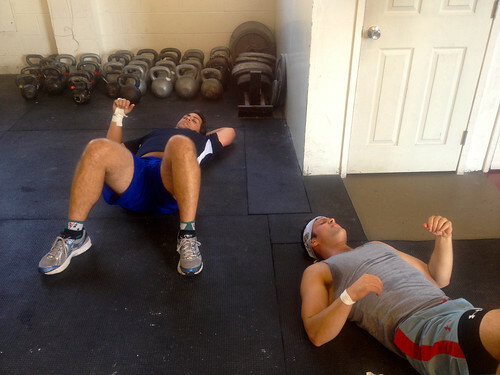 Most people new to crossfit will find themselves wanting to be at the gym as much as possible. I know I did. It was new and exciting and I was driven to see gains and improvements as quickly as possible. What most people don’t realize early on (especially if you’re young:) is that physical gains come from rest days. Day after day of heavy intense lifting breaks muscle down and stresses our body out. A good and necessary thing, but only if we allow time to repair and grow. Tweaks, strains, pulls and other injuries can be avoided from excessive overuse by getting on a schedule of work and rest days. The competitors take Thursday and Sundays off. This may not be realistic for everyone since we all have busy lives with varying schedules, but you should shoot for a basic schedule of at least 2 rest days every 7-8 days. If you are feeling really beat up, you may need an extra rest day just as an additional work day might be ok if you are feeling fresh and feisty. I try to take an extended rest period once a year that may last 1 or 2 weeks, sometimes longer if I’m on vacay. Tendons and joints take longer to heal and recover and while I may lose some conditioning, my body feels amazingly rejuvenated for the next work cycle. Listen to your body, train smart, and rest!